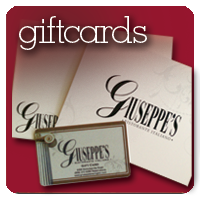 Giuseppe’s is now accepting reservations for Valentine’s Day 2019! Our hand-cut steaks are served with garlic mashed potatoes and the vegetable of the day. Please allow extra time for steaks ordered medium to well-done. two 4-ounce medallions of beef tenderloin, topped with prosciutto ham and provolone cheese, grilled to order, with a red wine and sage sauce. or with the vegetable of the day. Our traditional Italian Ice Cream.